As promised here are the links to the two performances of “Hey Ewe!” from last week. Enjoy watching our little stars! This term both Primary One classes have been learning about toys. We spent a week looking at teddy bears, writing about them, making teddy bears, designing jumpers for them, making teddy biscuits and we brought in our own teddy bears to show the class. We were all invited to a teddy bear’s picnic, where we played games, ate our biscuits and had fun! 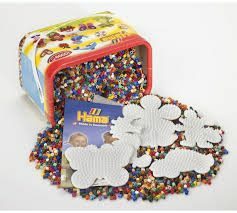 Do you have any unused Hama Beads and boards that you could donate to the school? P1 – 3 would love to receive any spare beads and boards to use at Golden Time. You can drop them off at the office. Thanks in advance from P1 – 3. We retold the story of the little red hen in class using prompts. Listen and hear our version.